Home » Community » You’re invited – help welcome new residents at Who’s New at the Zoo – 2! 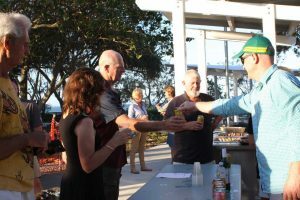 Meet and Greet – new and long term Rainbow Beach residents save November 17 for Who’s New at the Zoo – 2! So what can you expect at the second Who’s New at the Zoo? – Rainbow Beach’s very own meet and greet. The welcome dinner on Saturday, November 17 from 5pm, will once again have a stellar line up of community groups, local eats and entertainment – including for the first time, local performer, Joel Mak. Rainbow Beach residents and business owners can bring a plate and have a chat with people who are new to town. It is a family-friendly event! Community groups and businesses can set up stalls to attract new members and promote your services – for free (please – no raffles). The evening will be held at Lawrie Hanson Park playground, (remember L for Laurie and L for left of the look out) on Saturday November 17, from 5pm (and move to the hall in the event of wet weather). RSVP to Suzie on rainbowescape@outlook.com or call 0400 243 745 or Michelle at info@rbcn.com.au or call 5486 3561. It is supported by the Rainbow Beach Commerce and Tourism, Rainbow Beach Community Centre and Rainbow Beach Cooloola Coast Community News.